> Highlighted > Grammar Symbol Boxes – A Delightful Addition to Your Classroom! The boxes I am showing you are ones I have made over several years. Yours do not have to match exactly. Contents will differ based on the objects you have available and the interests of the children you’re teaching. 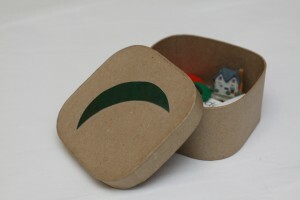 My boxes are based on objects I had on hand around my house and ones I found at craft stores. For the grammar symbols in each box, I started by cutting them out of felt, then I ended up using wooden symbols from a set I bought online. The labels were made here and there as I needed them, so they vary in size. Below is an overview of the Grammar Symbol Boxes. Please read all the way to the end before asking questions; any questions along the lines of “Can I use this object instead?” or “Would this kind of box work?”, I will answer, “Yes!” No need to ask. Customize the boxes and make them work for you. My ideas are just suggestions. There are also helpful links at the bottom of this post, including a free PDF listing the contents of each box as outlined below. 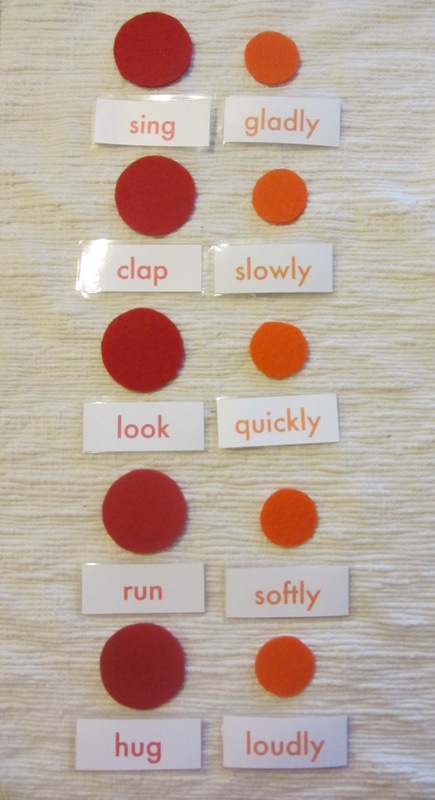 These boxes can used as the initial lesson for each part of speech, or they can be an extension if the child has already learned the parts of speech. For each box, the child should write or draw something on their paper after matching the symbols, objects, and/or labels appropriately. Control of use is usually a teacher or an older student. 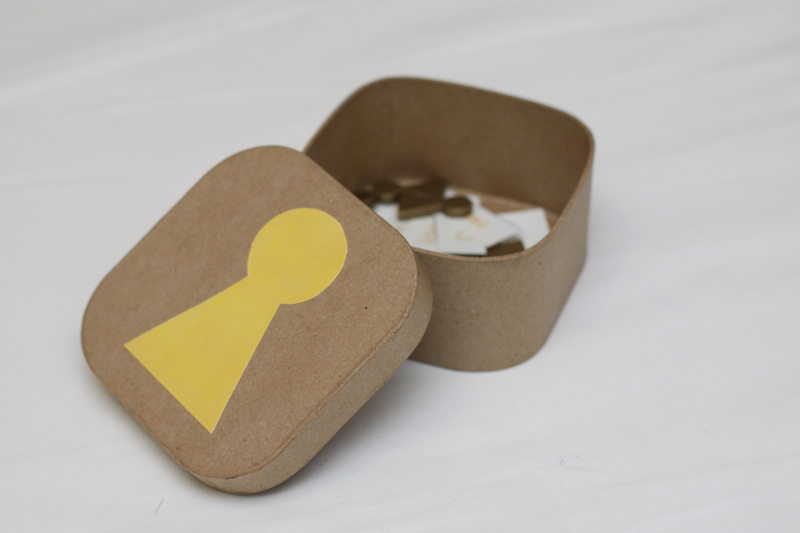 Nine boxes—can be cardboard, wood, or other container. Check craft stores, teacher stores, or the Container Store for boxes. 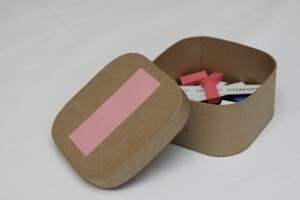 Each box needs to be big enough to hold labels, grammar symbols, and in most cases, small objects. Grammar Symbols — You will need quite a few of each symbol: at least 30 black triangles for nouns, 20 articles, 20 adjectives, 12 verbs, 6 adverbs, 4 conjunctions, and as many prepositions and interjections as you have labels. These numbers are approximate because it will depend on how many objects you put in the boxes. You will also need one grammar symbol to put on the top of each box. If you want these to be larger, you can cut them out of colored paper or cardstock and laminate, then glue or tape them to the top of the boxes. For Grammar Symbols, there are a few different routes you can take. You can buy a Grammar Symbols PDF and print, laminate, and cut. This way you can print as many as you need for your boxes. 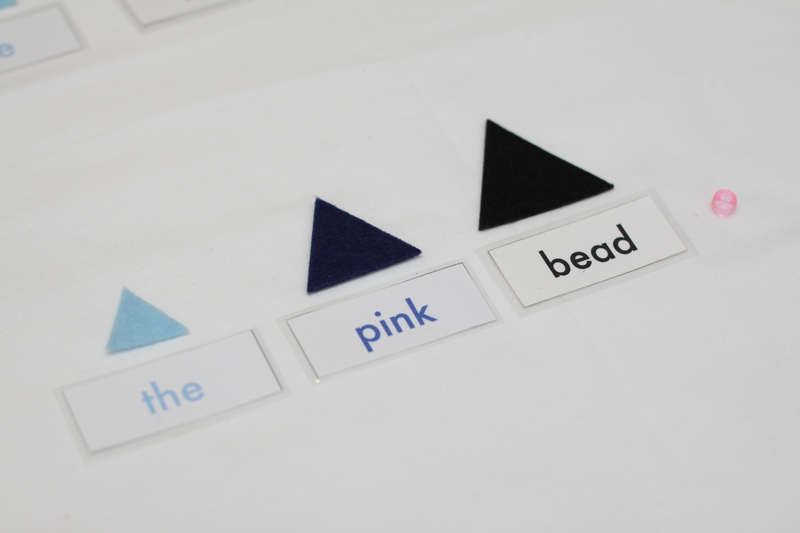 There are also paper and wood sets available from various Montessori companies. You can also cut them out of felt. 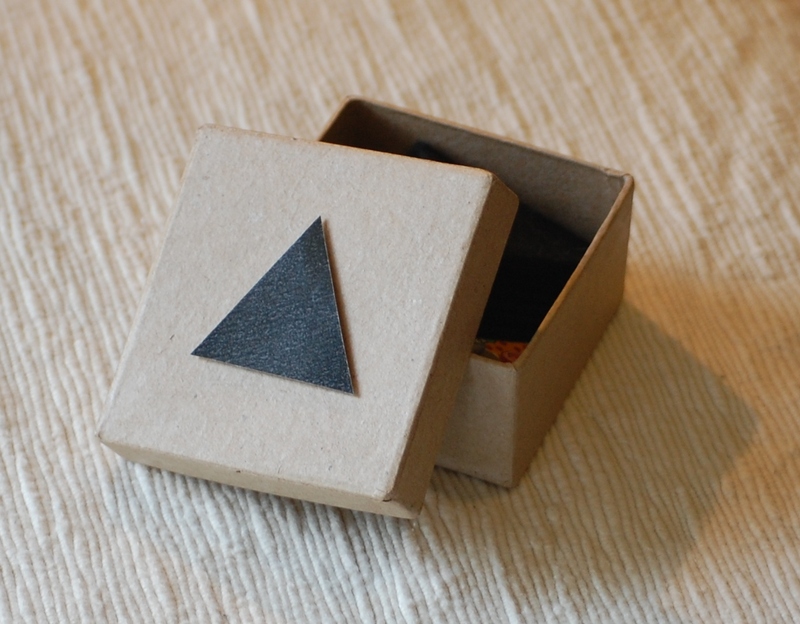 I used a combination of felt and wood symbols in my boxes. Labels — Some of the parts of speech (verb, adverb, interjection) use only labels and no objects. The noun box typically uses objects and no labels. The other boxes use a combination of objects and labels. It’s perfectly fine to hand-write labels for these boxes, or make them on the computer. I use Century Gothic font for mine. 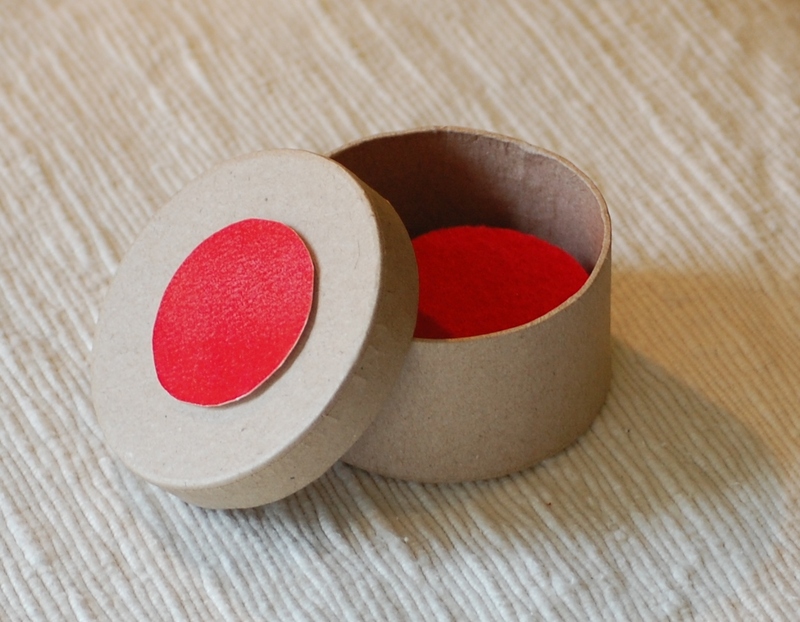 Many of the cards in our Grammar Cards Set can be used with these boxes, and have colored outlines to match the color of the symbol, but our Grammar Cards Set is definitely not an exact match for Grammar Symbol Boxes. 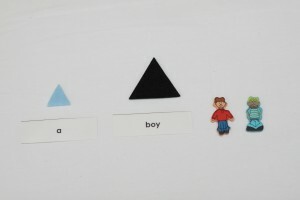 Pictures — My daughter is the one who had the idea to use pictures in the Pronoun Box. 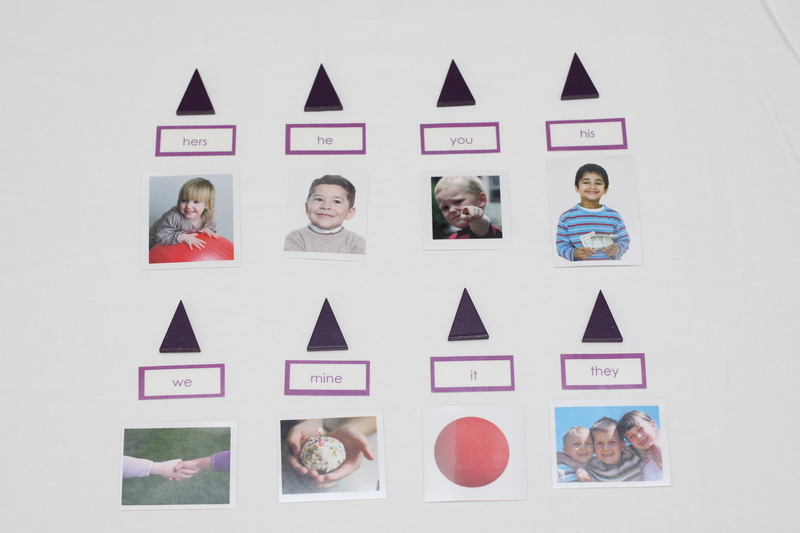 We found a variety of pictures of children (together or separately) and objects to use with the pronouns. Many times more than one pronoun will work with a picture. These are optional – you could use only labels and symbols in this box. 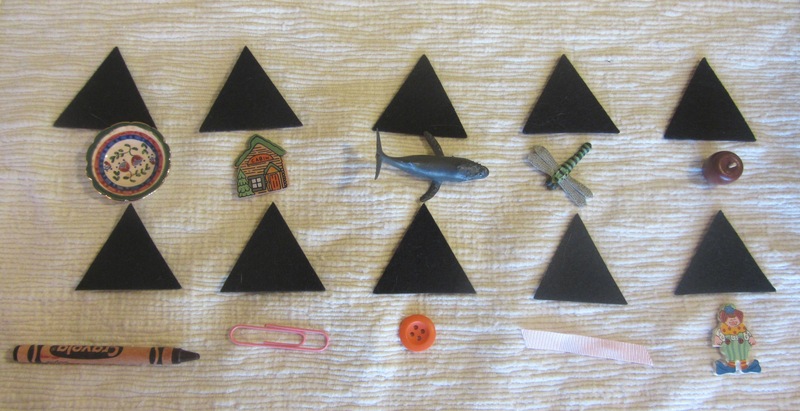 You will need a small box with a small light blue article triangle on it, and small light blue article triangles and black noun triangles to put with the objects. Funnily enough, there are fewer articles than any other part of speech (a, an, the) but this box is a very difficult one because of the difference between definite and indefinite articles. 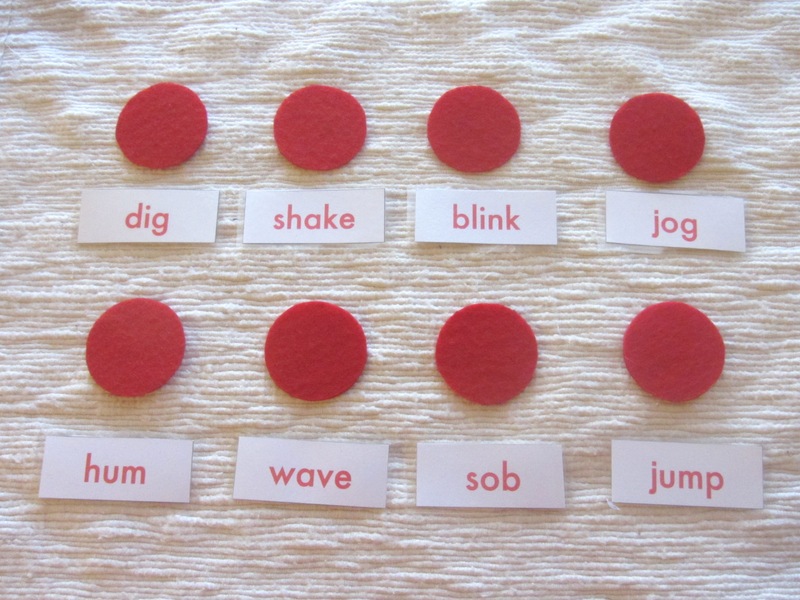 In order to use the “an” (used before a word that starts with a vowel sound), you will need at least one type of object that starts with a vowel sound (apple, eraser). In order to show the difference between definite and indefinite articles, you will need multiples of some of the objects. This box needs to have a red circle on it. If you can find a circular box, that would be great. 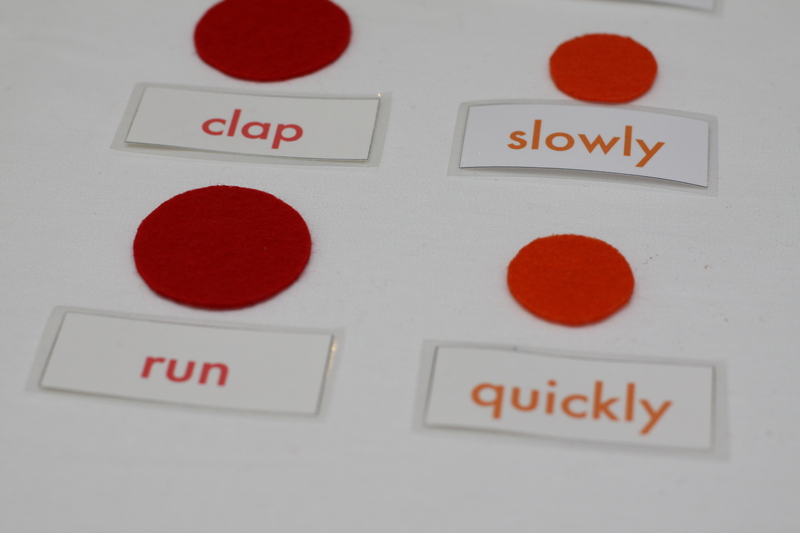 This box deliberately does not have objects, as to reinforce to the child that a noun is a “thing” that you can touch, hold, or see, but a verb is an “action” that can be done. 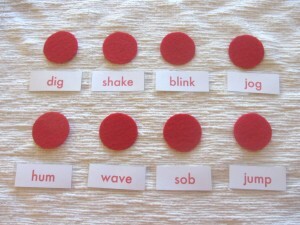 I recommend between 6-10 red circles and verb cards. This box also deliberately does not have objects, as to reinforce to the child that a noun is a “thing” that you can touch, hold, or see, but that an adverb modifies a verb, which you can not touch or hold. I recommend between 6-10 adverb and verb combinations, and their corresponding symbols. 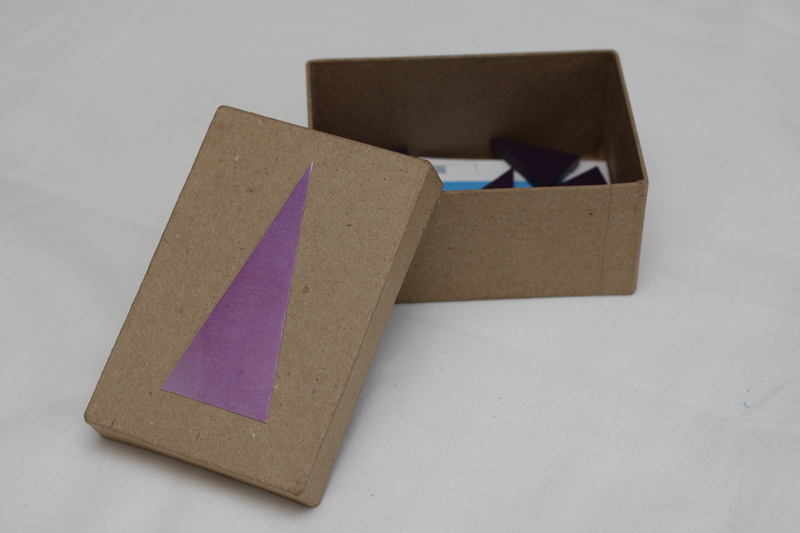 Originally I made this box with only symbols and labels; my daughter was the one who came up with the idea of including pictures to represent the various pronouns and I tried it and loved it. Of course you do not have to use the pictures if you don’t want to, you could use only symbols and labels. 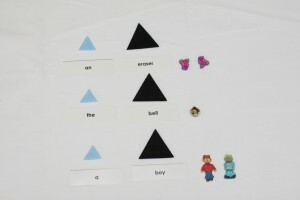 I recommend between 6-10 pronouns with labels or labels with pictures. I have often seen conjunction work with small vases and colored flowers. Montessori Services sells a set like that. I love that idea, but I found that this was less expensive and took up less room, so I like the idea of crayons. 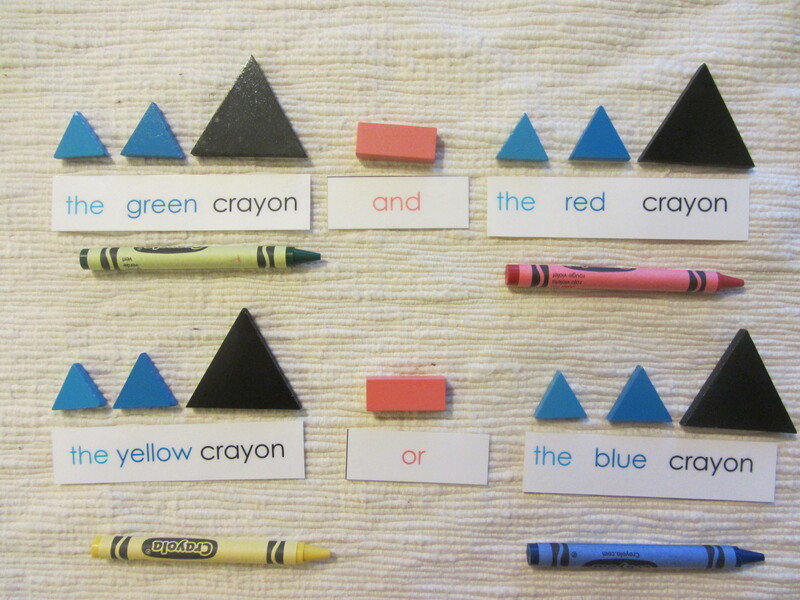 Of course you can find 4 different objects if you don’t want to use crayons. 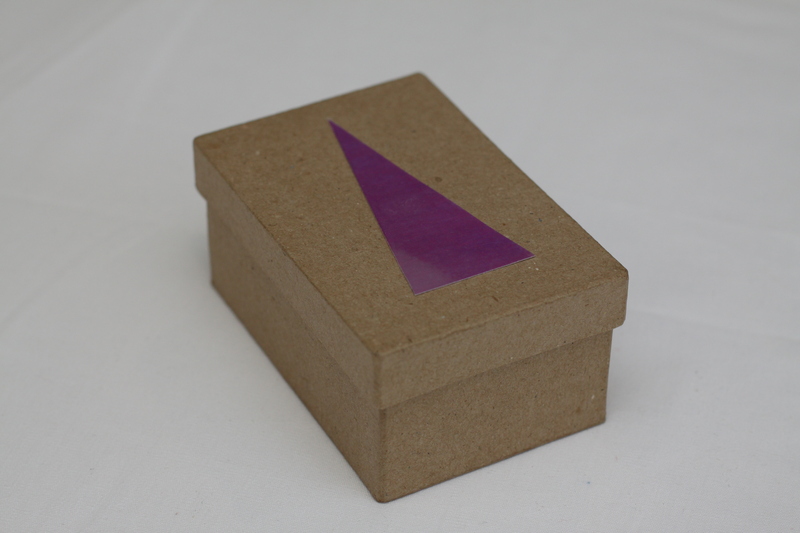 You can see that I used wooden grammar symbols for this box. For this box, I used crayons in 4 different colors (you can choose another simple, common object in 4 colors); you’ll need symbols for articles, adjectives, nouns, and conjunctions. Cards should match the object and color names. I find it best to use complete sentences for this work. So, you will need two labels for each object — one with the first word capitalized, to be the beginning of the sentence, (“The house”, in the picture below), and one in lowercase with a period at the end, to be the end of the sentence (“the hedgehog.”). The label “is” can be used as the verb in each sentence, so make a few of those. 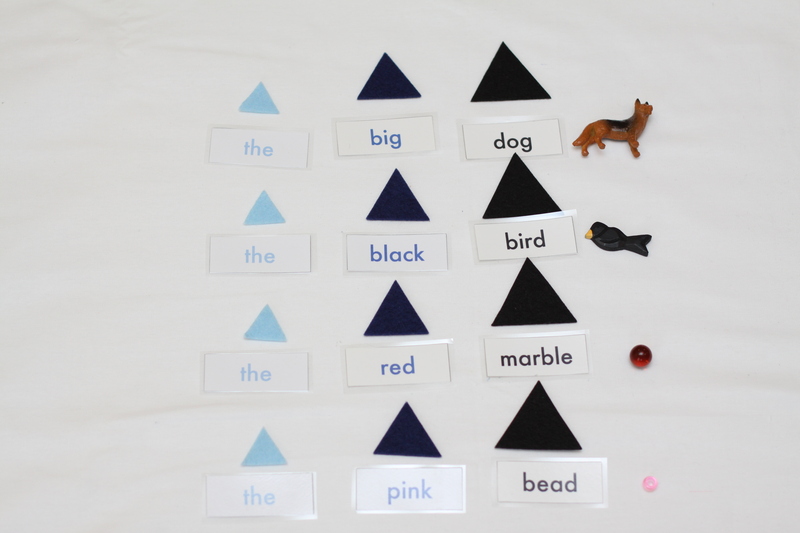 Children can mix and match the objects in various configurations (2 at a time), and start the sentence with either of the two objects as they desire. 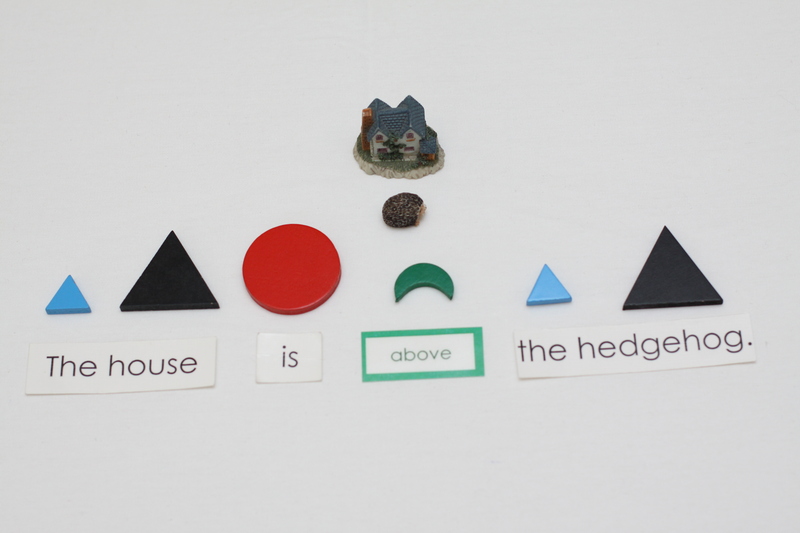 For this box, you will need at least 4 very different objects, symbols for article, noun, verb (use “is” for each sentence), and preposition. Labels for each object, several for “is”, and a variety of prepositions to choose from. This box is very straightforward: interjections are their own sentences! They can also be used at the beginning of a sentence with a comma after for less effect. You do not need objects for this box. 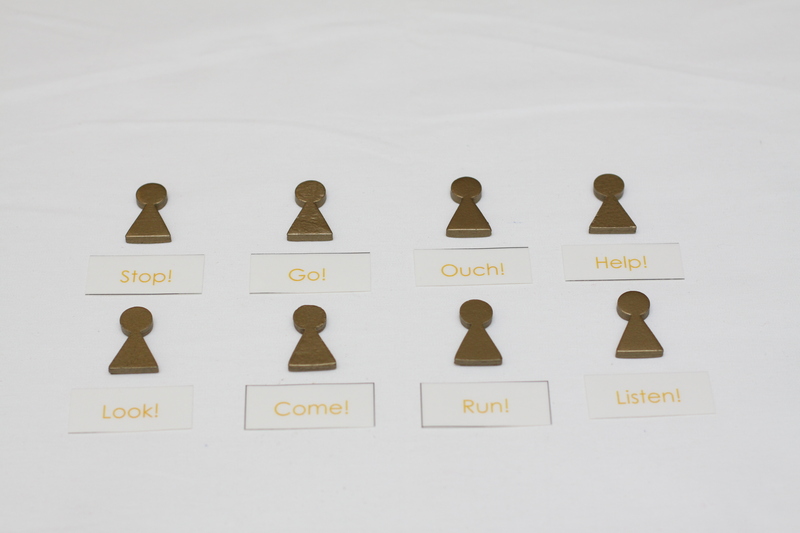 For this box, you will need conjunction symbols and conjunction cards. You can have as many as you like; I think 8 of each is a good amount. PDF Download: Grammar_Symbol_Boxes.pdf. This 2-page PDF has a list (taken from the top of the post) of everything you need to make all 9 boxes, plus a second page with pictures of the contents of each box. Easy to print and take with you to the store. 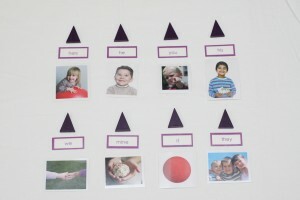 Grammar Cards Set – the cards in this set (18 cards for each part of speech) can be used in the Grammar Symbol Boxes. They do not coordinate with what I show in this post – I made separate cards for my boxes – and you would not find every card you need in this set (especially to go with the objects you put in the boxes, although the noun cards do include common household objects) but you would be able to use many of the cards for the boxes, and they have a colored border to match the color of the grammar symbol.